Dating services in the US will be a $3 billion a year business in 2018, growing since the previous year. Around 15% of US adults, or around 50 million Americans, say that they have or continue to use websites or mobile dating apps in their pursuit of romance. Some predict that revenue is expected to grow 25% by 2020. Still, it’s a fast-growing industry. According to the Pew Research Center, between 2013 and 2015, online dating usage has tripled among those between the ages of 18 and 24. Dating services also benefit from tailwinds such as an untapped market, increasing millennial spending power, young people delaying life milestones, as well as working longer hours. This is all on top of the growing ubiquitousness of broadband internet and growing acceptance of online dating. While few would be surprised to hear that young adults are active with online dating, they might be when they realize that those in their late 50s and 60s are also quite active. From 2013 to 2015, the share of 55- to 64-year olds has doubled from 6% to 12%. According to Nielsen data, one in 10 American adults spends more than an hour a day on a dating app. There’s been much talk about the impact dating apps have had on perpetuating a “hookup culture” and instant gratification over a genuine or more serious collection. What do the numbers tell us? 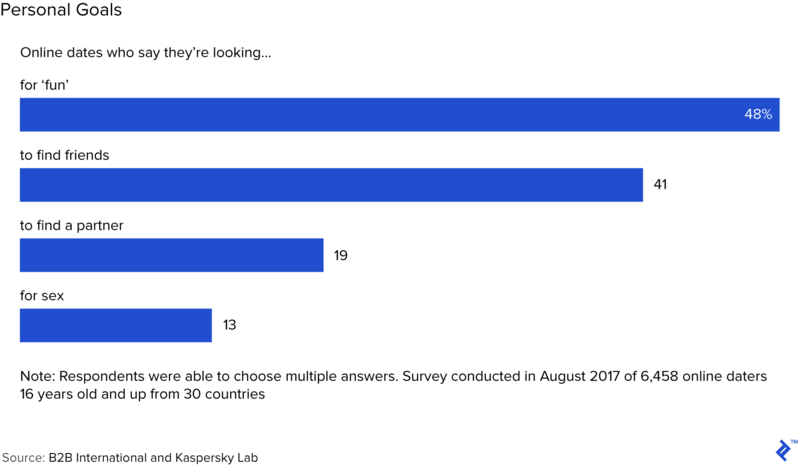 In a survey conducted in August 2017 of 6,458 online daters from 30 countries revealed that 48% of online daters are looking “for ‘fun’, among other things. 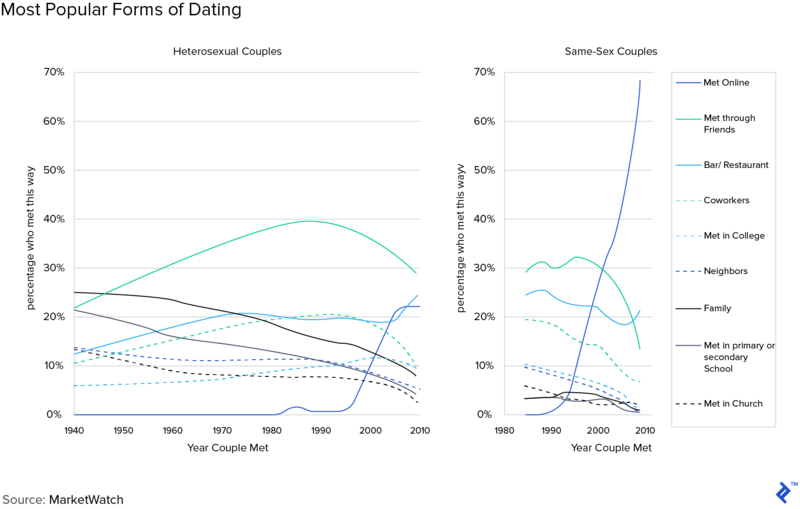 According to MarketWatch, online dating has become the most popular form of dating for homosexuals, and the second most popular way to meet partners for heterosexuals (after meeting through friends). Each app has its own competitive advantage or spin on the dating game: With its monthly subscription fee, Match.com attracts people willing to put their money where their mouth is. Tinder pairs potential hookups based on a mere glance and swipe of a photograph, is easy to use, and is user-friendly. Bumble uses a similar format to Tinder, but with a twist: only women can send the first message. The League is an elite dating app focused on accomplished, ambitious young professionals. 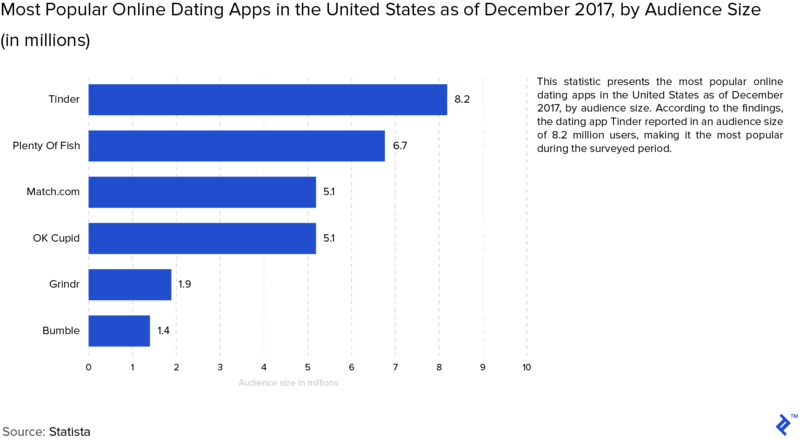 When it comes to the most popular apps in the US by audience size, Tinder, Plenty of Fish, Match.com and OkCupid lead the pack (respectively). However, when it comes to user engagement, Grindr (12 hours 26 minutes/month), Tinder (2 hours 39 minutes/month), OkCupid, and Bumble are at the top. The biggest player in the online dating game, the Match Group, dominates 25% of the market share. The second largest competitor is eHarmony, with just under 12%. Match Group actually comprises 45 brands, including big names such as Match.com, OkCupid, and Tinder. Membership subscriptions: The subscription model is the oldest model in the dating app sphere, requiring users to pay a fee to use the app for a set period of time. The payments are typically recurring. It’s a higher barrier to entry for use. Zoosk, eHarmony, and Chemistry, and Our Time are also paid dating services. Typically, the paid subscriptions are cheaper by the month if the user commits to a longer period of time. Freemium: The freemium model allows for users to sign up and use the basic functionalities of the app for free, while the app generates revenue either via advertising or unlocking enhanced features for a fee. Without a barrier to entry, freemium dating apps often wait to build scale, loyalty, and active users until they introduce paid features. Freemium – Advertising: In-app advertising is a way for the app to generate shared revenue with advertisers from clicks, views or transactions. Certain apps and the “swipe left or right” mechanism seems particularly suited for native advertising, ads that match the look and feel of the media format that they appear in. Freemium – Upgraded Features: Though basic membership is free, users can pay for extra, enhanced features. As of September 2017, Tinder was the highest-grossing app on the app store among US consumers. In the same month, Tinder rolled out their Tinder Gold feature, which, for $4.99 a month, allows users to view others who have “liked” them already before they have to like them back. In second place is female-friendly Bumble, which also only started to monetize in 2016. Over 10% of Bumble users put forward $9.99/month for perks such as extra time to decide whether a prospect deserves a message from them. It might be hard to imagine or remember, but there was once a time when going on a date with a stranger you met online was a strange concept—frowned upon, even. Today, however, millennials have led the charge on transforming the dating industry and making online dating universally accepted. In fact, a January 2018 Statista survey revealed that 12% of 18-29-year-olds admit to being in a relationship with a partner or spouse that they met online. If you continue to have doubts, consider that there are now over 1,500 dating apps or websites looking to draw single men and women to their product, and to match them with one another. According to research firm IBISWorld, dating services in the US will be a $3 billion a year business in 2018, growing since the previous year. Around 15% of US adults, or around 50 million Americans, say that they have or continue to use websites or mobile dating apps in their pursuit of romance. While these numbers are promising, it’s interesting to note that some sources indicate that revenue growth for the industry is projected to slow through 2022. 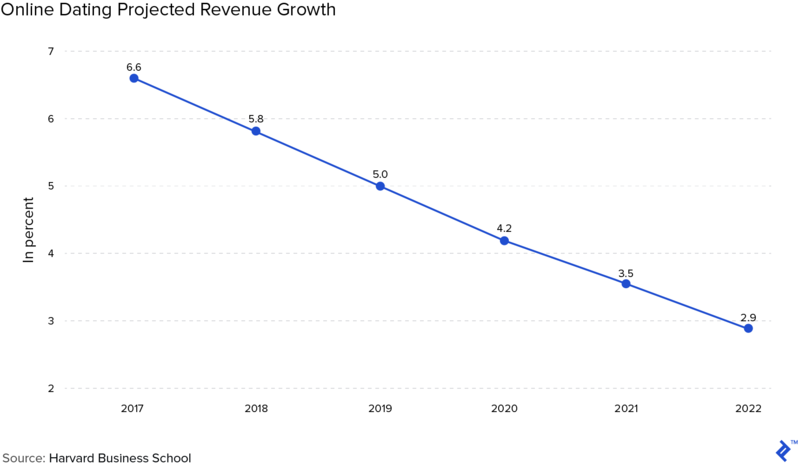 Others, however, predict that revenue is expected to grow 25% by 2020. Still, it’s a fast-growing industry. According to the Pew Research Center, between 2013 and 2015, online dating usage has tripled among those between the ages of 18 and 24. Beyond its existing users, dating services benefit from tailwinds such as an untapped market, increasing millennial spending power, young people delaying life milestones such as marriage and home purchasing, as well as working longer hours. This is all on top of the growing ubiquitousness of broadband internet and growing acceptance and legitimacy around online dating. While few would be surprised to hear that young adults are active with online dating, they might be when they realize that those in their late 50s and 60s are also quite active. From 2013 to 2015, the share of 55- to 64-year olds has doubled from 6% to 12%. According to Nielsen data, one in 10 American adults spends more than an hour a day on a dating app. There’s been much talk about the impact dating apps have had on perpetuating a “hookup culture” and instant gratification over a genuine or more serious collection. What do the numbers tell us? In a survey conducted in August 2017 of 6,458 online daters over the age of 16 years old and from 30 countries revealed that 48% of online daters are looking “for ‘fun’, among other things. When it comes to the most popular apps in the US by audience size, Tinder, Plenty of Fish, Match.com and OkCupid lead the pack (respectively). However, when it comes to user engagement, Grindr (12 hours 26 minutes/month), Tinder (2 hours 39 minutes/month), OkCupid, and Bumble are at the top. And, while Tinder is the most popular among 18-29-year-olds, Match.com is most popular for the 30-44 demographic. Still, when it comes to actual ownership by company, these two models become more blended. The biggest player in the online dating game, the Match Group, dominates 25% of the market share. The second largest competitor is eHarmony, with just under 12%. Users might not realize that Match Group actually comprises 45 brands, including big names such as Match.com, OkCupid, and Tinder, and it IPOed in 2015. 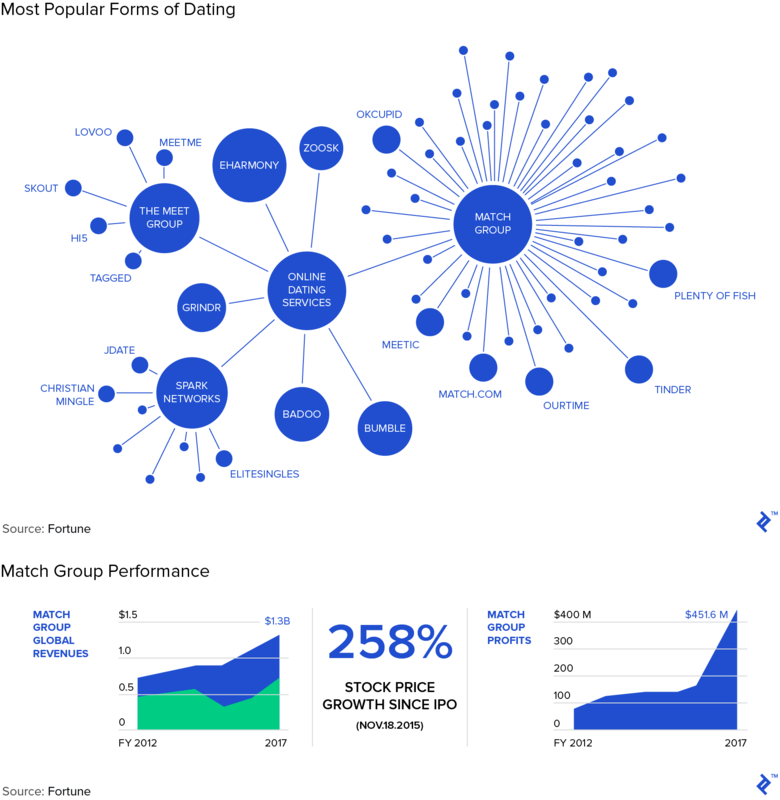 The second is the Match Group’s 2015 IPO. Match’s size works to its great benefit since users switch frequently between its sites. With so many dating sites, it can encourage customers to try out its other sites as well. As a quick aside, there’s a controversial history between Whitney Wolfe, founder of Bumble, and Justin Mateen, co-founder of Tinder—making the Match Group’s attempted $450 million acquisition of Bumble that much more contentious. Overall, it’s a difficult market to break into because of the nature of the product. Dating apps are essentially another form of social media, where a product’s value often hinges on how many people are on it and using it. New sites may have difficulty garnering more users, and, according to OkCupid’s chief product officer Jimena Almendares, “If you visit a product and there aren’t that many people to see, the likelihood of you coming back is going to decrease rapidly. Even though online dating is growing and it’s a more normal thing than ever, it’s hard for new sites because they can’t get enough people.” This hasn’t stopped niche dating apps from launching like wildfire, including the likes of Gluten Free Singles, Clown Dating, and Bristler (for beard lovers), niche sites experience difficulty building scale and can be difficult to compete with larger sites that offer detailed filtering options. It’s perhaps due to this dynamic that the tech and venture capital world has been tepid in its dating app investments. According to PrivCo, while funding was up in 2014, the size of individual rounds is declining. Small amounts of funding are generally not enough for the large marketing budgets that dating apps require for user acquisition. From early 2016 to 2017, early-stage startups only received $7 million in funding. For the dating apps still seeking funding, all hope is not lost. There are some common traits among the ones who have received funding in the last few years. For one, it’s favorable to be based in China. In the last couple years, the largest rounds have been raised by Chinese companies, including $70 million in Series D for Tantan, which is similar to Tinder, and Blued, a Chinese version of Grindr, raised a Series D of $100 million. 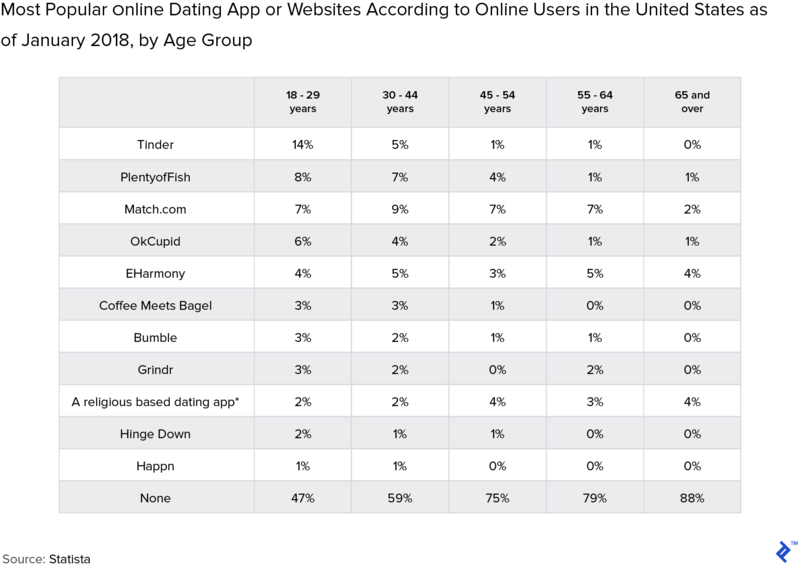 Investors also seem to prefer apps that simplify dating options. Examples include Coffee Meets Bagel, which has raised $11 million matches women with only a few men who have expressed interest in them already. While it might become more difficult for smaller players to succeed, the industry has been abuzz since Facebook announced its foray into online dating. Facebook users will soon be able to elect to create a dating profile on Facebook, and since Facebook has so much data on its users, such as mutual friends, dating preferences, and common interests, it claims it should be able to deliver better matches. Users will be able to browse events in their city, but their activity and dating profiles will only be visible to others also utilizing the dating feature. The feature will be free and will span all groups, aiming to make “meaningful connections.” Facebook’s dating service will start testing later in 2018. Still, Facebook could face some obstacles in building enough separation between the dating service and the legacy social network; some users might not like having both activities live on one app. And, Facebook has failed many times before, including Snapchat copycat apps Slingshot and Poke, as well as Room, which was meant to be a pseudonymous app that allowed users to create forums about any topic. How Will This Affect Existing Dating Players? Facebook’s entry into the dating world took Match Group investors by surprise, believing them to be insulated from competition from Facebook, Amazon, Netflix, and Google (FANG). And, among the Match Group’s many properties, Match.com might be the most vulnerable to Facebook. Match.com charges a monthly fee of $40, while Facebook’s offering will be free of charge. The announcement sent Match’s stock price plummeting 22%. Joey Levin, chief executive of IAC, Match’s parent company, responded to the news with a jab: “Come on in. The water’s warm. Their product could be great for US/Russia relationships.” Amanda Ginsberg, president at Match, noted that Facebook has always actually been competitor since it’s always been another place for people to meet. If Facebook sticks to simply helping people find events and groups to connect at, there may not be as much overlap between the two services. On an earnings call post-announcement, Ginsberg also pointed to the fact that only a quarter of Tinder users still rely on the Facebook platform to access the app. At another point, Ginsberg indicated that users might be wary of their privacy with Facebook, pointing out that less than 5% of Match’s revenue while Facebook’s is 98.5%. Other apps have indicated that they might actually move closer to Facebook. For example, Bumble, founded by a former Tinder executive, said they had already reached out to Facebook regarding how to collaborate. And, “One thing everyone seems to agree on is that Facebook’s effectively endorsing online dating will be a huge legitimization event for the industry,” says Jefferies Internet analyst Brent Thill. According to Amanda Bradford, chief executive of The League, an elite dating app, “Facebook is validating that dating is a high-tech industry with really interesting and hard problems to solve. I don’t think Match looks at it that way,” she said. So, how exactly do dating apps make money while keeping in mind the importance of utility to the user in the space? In general, the business model for dating apps falls into three broad categories: subscription plans and freemium, which utilize advertising and in-app purchasing. The subscription model is the oldest model in the dating app sphere, requiring users to pay a fee to use the app for a set period of time (usually a week or a month). The payments are typically recurring. It’s a higher barrier to entry for use. The most prominent example of such is Match.com, which charges users $40/month to access the site. These sites are focused on finding people a serious relationship and tend to skew towards an older population who are willing and able to pay. Zoosk, eHarmony, and Chemistry, and Our Time are also paid dating services. Typically, the paid subscriptions are cheaper by the month if the user commits to a longer period of time. For example, eHarmony charges the following: $42.95 for six months, $25.95 for 12 months, and $10.95 for 24 months. The freemium model hinges on the concept where users can sign up and use the basic functionalities of the app for free, while the app generates revenue either via advertising or unlocking enhanced features for a fee. Without a barrier to entry, freemium dating apps often wait to build scale, loyalty, and active users until they introduce paid features. They typically use a combination of both options. In-app advertising is a way for the app to generate shared revenue with advertisers from clicks, views or transactions. Certain apps and the “swipe left or right” mechanism seems particularly suited for native advertising, ads that match the look and feel of the media format that they appear in. In April 2015, Tinder launched its first ad campaign for Budweiser, where users viewed a Budweiser video within a few swipes. Users could “swipe left” to pass and “swipe right” to like the advertisements, data which was tracked by Tinder for Budweiser. It’s not hard to see why Tinder would pursue this strategy: 50 million users who are very engaged. However, a brand’s approach to this audience must be strategic. For example, when movie Ex Machina was in its promotion phase, the film’s main character “Ava” was introduced to Tinder users as a romantic prospect (in the movie, she’s a robot). Many users who didn’t catch on to her questions like “What makes you human?’ often realized what was happening when Ava’s admirers were directed to her Instagram profile, which promoted the movie. The campaign went viral. However, Facebook has gone on record saying that its dating service will not include ads. Though basic membership is free, users can pay for extra, enhanced features. As of September 2017, Tinder was the highest-grossing app on the app store among US consumers. In the same month, Tinder rolled out their Tinder Gold feature, which, for $4.99 a month, allows users to view others who have “liked” them already before they have to like them back. In its most basic functionality, Tinder only reveals users’ identities once they had both independently matched with each other. The Tinder Gold feature has been added on top of two existing features: the “Tinder Plus” upgrade that ranges from $9.99 to $19.99/month, which allows users to like an unlimited number of people within 12 hours (basic Tinder is capped at 100 likes). Another perk of Tinder Plus its “Passport,” which allows users to adjust their geographical location before even arriving in a new city. It took Tinder about three years since its inception to start monetizing, as it was working to build its user base and loyalty before turning on the monetization engine. About 5% of Tinder users pay for these services. In second place is female-friendly Bumble, which also only started to monetize in August of 2016. Over 10% of Bumble users put forward $9.99/month for perks such as extra time to decide whether a prospect deserves a message from them. The perks include Rematch, Beeline, and Busybee. 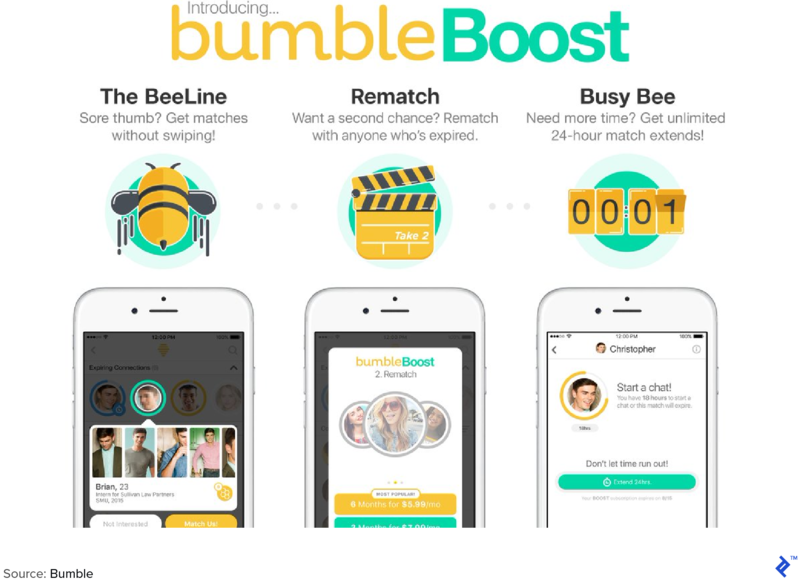 BeeLine will automatically match users with people who have already liked their profiles; Rematch keeps expired matches in a user’s queue (Bumble matches expire in 24 hours if no conversation is started), so users can try once more to get their attention; BusyBee gives daters unlimited extensions on the 24-hour time limit for contacting a new match. Bumble uses this in combination with hyperlocal, targeted advertising. Read Receipts: For messages you’ve sent, you can see whether your connection read it and at what time. Activity Reports: Statistics about each user, including the percentage of times they engage in chats with their connections, percentage of time they send the first message, whether they’ve used the app within the past 72 hours, and their average response time. 6,000 Beans: A replenishment of the in-app currency every month. Keep in mind that 3,000 beans cost about $25. It’s clear that the online dating industry is here to stay. Some say it’s already changed the very fabric of society and could lead to stronger, more diverse marriages. It will be fascinating to see what’s upcoming, especially with Facebook entering the online dating industry—perhaps the death of niche apps, or the death of swiping. What percent of America uses online dating? Is Bumble a dating site? Bumble uses a similar format to Tinder, but with a twist: only women can send the first message, meant to cut down on “sleazy” messaging from men. It’s the fastest-growing online dating app in the U.S.